Microsoft promotes its in-house Photos app as the best possible solution for storing your photos in Windows 10. While Microsoft’s is indeed a very solid option, some users might want an alternative. A service that arises as one of the best alternatives for the Photos app in Windows 10, is another popular photo-storing service, Google Photos. Google Photos natively works the best on Android devices, where it’s also most used. But not may users know that you can actually use Google’s photo-storing service on Windows desktops, as well. So, we’ve decided to write a full guide about using Google Photos in Microsoft’s Windows 10, just in case you want an alternative for its native Photos app. Unfortunately, Google Photos is not a full-fledged Windows 10 app, like its the case with Photos. So, you can’t use a single app to both upload and access uploaded photos. In fact, you can only access uploaded photos in a browser, as Google Photos doesn’t have its client for Windows (10). But there’s one tool you can actually use on your Windows desktop. 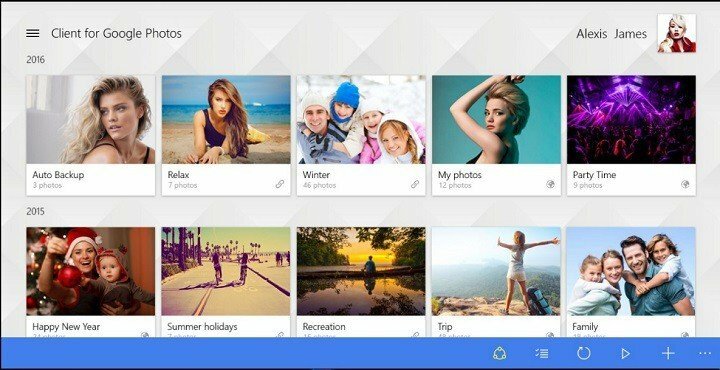 That tool is called Desktop uploader, and it allows you to automatically upload your desired photos from your computer to Google Photos. To download this tool, visit Google Photos’ website. Once you’ve downloaded Desktop uploader, install it, and enter your Google Account login credentials. After that, the tool is going to ask you to include a few folders from where you want your photos to be uploaded. 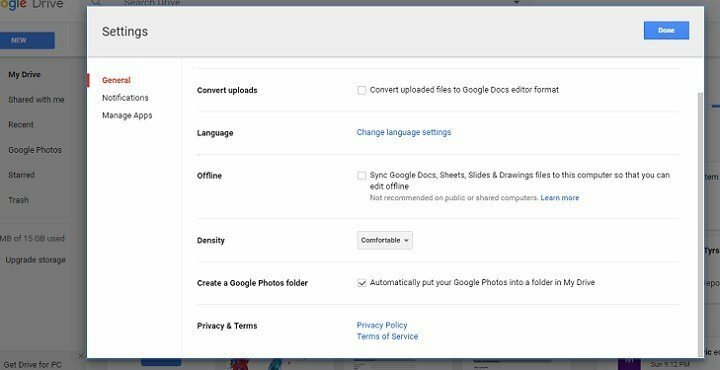 Once you include all desired folders, just click OK, and your photos will be uploaded to Google Photos automatically. 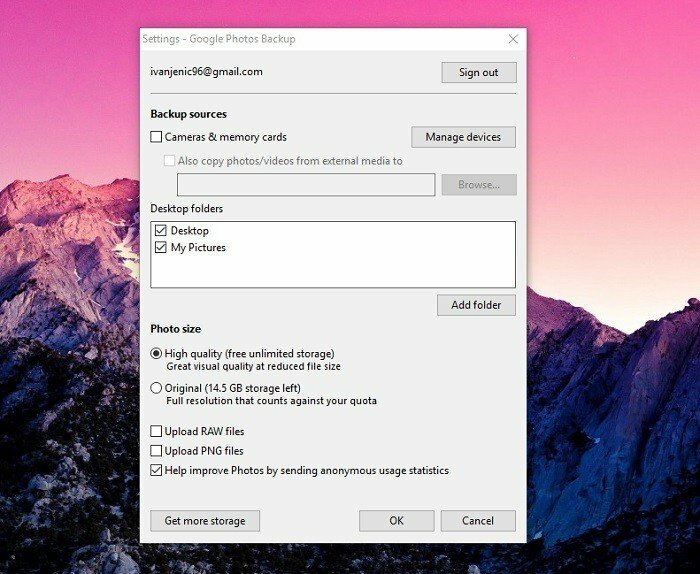 You can set up this tool to open on system’s startup, so any time you add a new photo to a select folder, it will be automatically uploaded to Google Photo’s cloud. As we said, you can later access uploaded photos in browser, on Google Photo’s website. 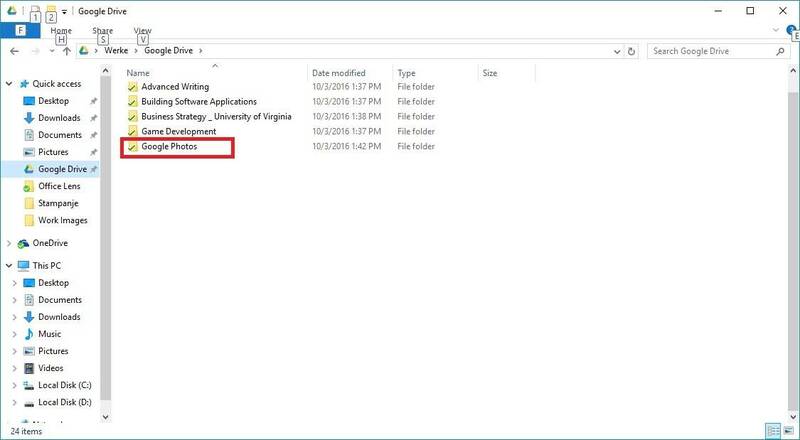 Although there’s no direct way to access Google Photos on your Windows 10 computer, you can take a slightly different road, and make it available via Google Drive’s client for Windows. 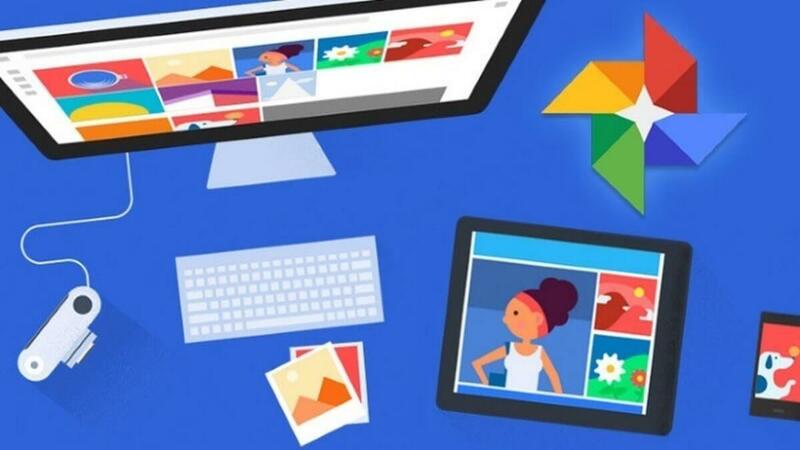 All you need to do in order to be able to access Google Photos via Google Drive is to connect two services, and download Drive’s official client for Windows Desktop. Now, all your Google Photos images are going to be shown in Google Drive. So, all you need to do now is to make the accessible from Windows Desktop. To do that, simply download the Google Drive Windows client, sync all your content, and the Google Photos folder is going to be there. To download Google Drive for desktop, visit this link. Once you’ve installed it, wait a few minutes for syncing. When the process is done, just go to the Google Drive folder on your computer, and open Google Photos. For almost every service whose official app is missing from the Windows Store, there’s a third-party alternative. And Google Photos is not an exception. So, if you don’t want to access Google Photos in browser, or via Google Drive, you can download the third-party app, and have this service functioning on your computer. The best third-party Google Photos client for Windows 10 you can currently find is an app called Client for Google Photos. It allows you to do anything as if you would do with the official app. You can access your photos and albums, upload new photos, create new new albums, watch slideshows, and more. You can download the Client For Google Photos for free from the Store, but there’s also a paid version, in case you want some additional features. Unfortunately, this is the only known way to access Google Photos locally. As far as we know about Google’s policies about Windows, we shouldn’t expect the full-fledged Google Photos app to arrive on any of Microsoft’s platforms soon. Google Photos is not the only Google’s service that’s missing from Windows, for example, users are still waiting for the official apps of YouTube, Gmail, Google Play, etc. 2018 Update: Google Photos appeared in late October on Microsoft Store. The app had Google LLC as publisher in the description and stood there for a while until Microsoft removed it. You can find it on Google Store or on the official Google website. Just download it from there and start to use it. If some of you already tested the Google Photos for Windows 10, let us know in the comment section about your experience. If you have any comments, or questions, don’t hesitate to tell us in the comments, below. Editor’s Note: This post was originally published in October 2016 and has been since revamped and updated for freshness, accuracy, and comprehensiveness.